Occasionally, existing service operations might not be available for selection within the AIF configuration forms. This issue can occur with the standard document services provided by Microsoft and also with custom services that are newly created. The fix is simple and only takes a few minutes to complete. When configuring ports for AIF, service operations which are known to exist sometimes do not show up in the configuration forms. The LedgerGeneralJournalService should be available out-of-the-box with AX 2012, but in this example it doesn’t appear in the list of Service operations. If you’re missing standard document services (e.g. LedgerGeneralJournalService) in a new installation of AX, the Set up Application Integration Framework task on the Initialization checklist might have been skipped during the original installation process. If you’re missing a custom service, you might have forgotten to register the service. In my example above, the LedgerGeneralJournalService was missing from the Service operations in the Inbound ports configuration form, but LedgerGeneralJournalService does appear in the Services node of the AOT. Right click on any service in AOT > Services and click Add-Ins > Register service. On the AIF services form, click the Refresh button. The refresh operation will take a few minutes to complete. When it’s done, the missing services will be available for selection in the AIF configuration forms (e.g. Inbound ports > Service operations). 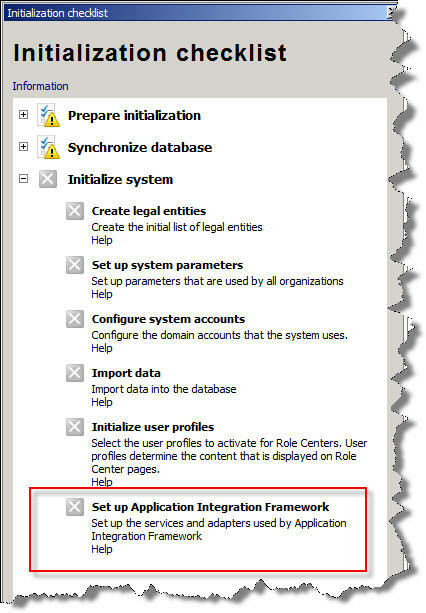 This entry was posted in 2012, AIF, Dynamics AX, MorphX and tagged Integration, Microsoft, Troubleshoot by ERP Technician. Bookmark the permalink. Thanks Sir its help me lot!